Lakshmi’s life was saved at the Karuna Society for Animals and Nature, in Puttaparthi, Andhra Pradesh, by surgery that removed a vast quantity of plastic bags. Since then she has given birth to her calf, now six weeks old, and the two are happy, healthy, and well cared for. However Lakshmi’s situation was not unique. It has been discovered that the problem of cows eating plastic bags is universal in the cities of India. 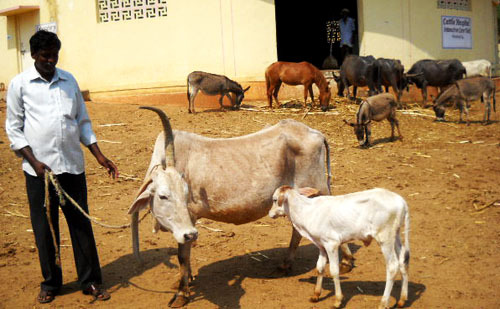 The traditional worship of the cow contrasts sharply with the circumstances of the cow in India today. Although the life-saving surgery performed on Lakshmi is shown in graphic detail, the film is beautifully done, with great dignity and perception, and a remarkable lack of blame or negativity. The music, the narration, and the cinematography are extraordinary. The film speaks with the gentle voice of India and gives a very moving presentation of reality, with statements by well-known animal advocates; among them Clementien Pauws, Philip Wollen, Rukmini Sekhar, Dr. Chinny Krishna, and Pradeep Nath. It is a true vision of India, encompassing all its multiplicity of paradoxes, with its beauty and its tragedy, and a call by the group, the Plastic Cow Team, to do away with the use of plastic bags which inflict such suffering on the cows and other animals of India. The Winsome Constance Kindness Trust, in Australia, has provided funding for all the cow surgeries performed by the Karuna Society for Animals and Nature and for the production of the documentary. To view the Plastic Cow on YouTube, click here. To visit the website of the Karuna Society for Animals and Nature, click here. 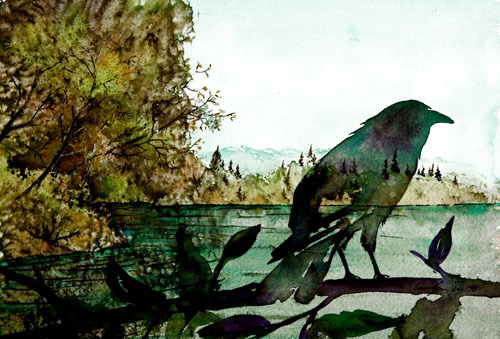 To see more of Carolyn Doe’s beautiful watercolors – originals, prints, and greeting cards – of animals and landscapes, click here. There is also on her website artwork that is batik on silk; this is not yet ahimsa silk, but Carolyn is looking into using ahimsa silk for her artwork in the future, so if you check back later, we’re sure you’ll find stunning new artwork that is batik on ahimsa silk! This lovely pup and fourteen others will be looking for their forever homes. Let’s Live Together rescues motherless puppies from the streets of Bangalore, places them with foster parents – then, while the puppies are being nurtured and nourished, finds them loving homes. All puppies are required to be spayed/neutered. They conduct adoption camps all over the city, and their Adoption Center is open on Sundays from 10 am to 4pm. Their project “Life on the street” features captivating photos of the puppies and shows the lives of street dogs in Bangalore. The photos are taken by Achala Paani, talented photographer and Founder Trustee of Let’s Live Together. They promote the “adopt, don’t shop” message. And finally, Happy Birthday to Let’s Live Together which will turn three years old on April 13, 2012! For more information, to visit their website, click here. Or their Facebook page, click here. 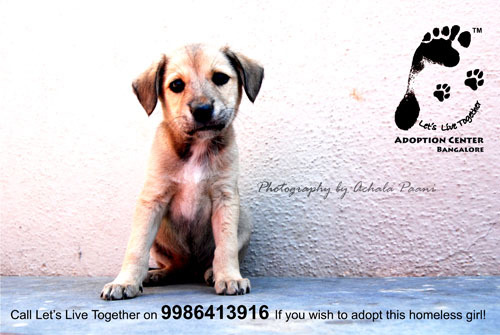 Call : 9986413916 to adopt a puppy. 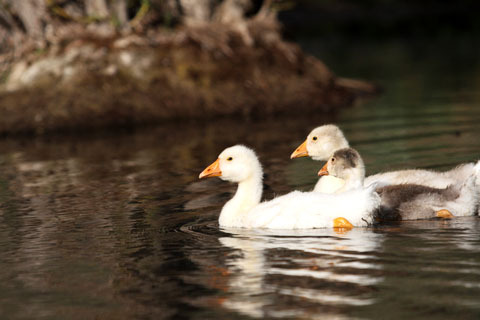 Speak up for California Geese! California Senator John Burton in an op-ed piece in the April 10, 2012, L.A. Times describes the efforts taken by the fois gras industry to fight the enforcement of the California law banning foie gras. Foie gras is a food product, considered a “delicacy” though there’s nothing delicate about it, made from the livers of geese. It’s production is extremely inhumane and causes great suffering to the geese. The citizens of California passed a law in 2004 against this very cruel practice, and the law will begin to take effect in July 2012. Senator John Burton wrote and promoted the bill. This law is very important and outlaws this kind of cruelty to geese by banning the sale and production of fois gras in California. The law has already been passed, which is good! The industry which profits from the inhumane treatment of geese is now opposing having the law take effect, despite the very long seven and a half year delay they were given. You can send a letter supporting the article by Senator John Burton and the ban on fois gras to the Editor of the L.A. Times here. Thanks to Karen Dawn for this news! To visit the website of DawnWatch, an animal advocacy media watch, and sign up for alerts, click here. Photo: © Alexandr Vlassyuk | Dreamstime.com / Young geese. At this link, you can write on behalf of sea otters, so they can swim freely in waters off the California coast, instead of having a no-otter zone where they’re not allowed to swim! Wouldn’t it make more sense to have a no-people zone in the ocean? Friends of the Sea Otter (FSO) is an advocacy group dedicated to actively working with state and federal agencies to maintain the current protections for sea otters as well as to increase and broaden these preservation efforts. Egypt: A New Zealand team lends a hand and ESAF celebrates 10 years! 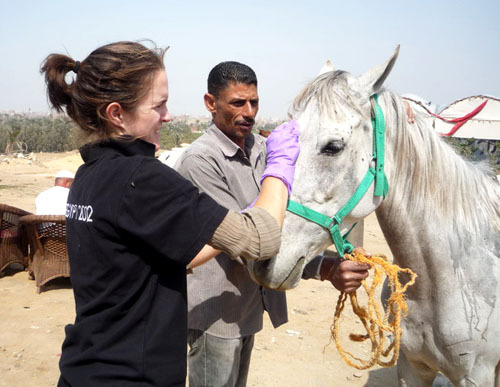 The Egyptian Society of Animal Friends (ESAF) is hosting the Kiwi Care Team from New Zealand; fifteen vets, farriers, and equine dentists who are doing a terrific job, fixing up teeth, hooves, and patching up injuries for the Pyramids animals. ESAF just held a big celebration to mark their tenth anniversary. Congratulations to them for all they’ve accomplished and for all their dedicated work for the animals! Over the past year, throughout all the challenges of the Arab Spring, they’ve done a magnificent job overcoming hurdles to continue to provide food and vet care to the many horses, camels, and donkeys who generally give rides to tourists, but who’ve had a difficult few months because of the lack of tourists during these unsettled times. The equine owners have been thankful for all the help given to their animals. For the Facebook page of the Kiwi Care Club, click here. For the Facebook page of ESAF, click here. 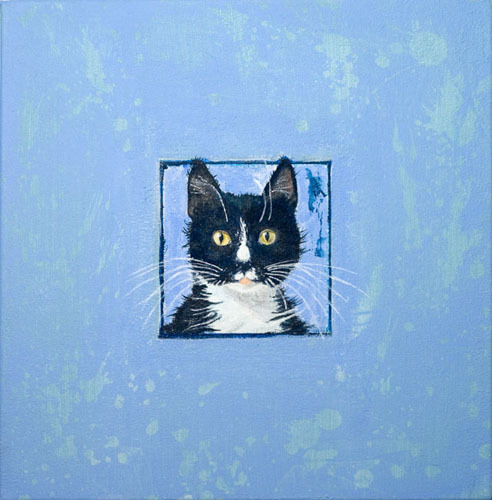 A painting by Lia Redegeld of their cat Pip about ten days after they picked her up from the shelter. To see more of Lia Redegeld’s paintings, click here. The website is in Dutch, but the paintings are charming and universal.